Far red radiation, typically described as energy between 700 and 800nm, (Figure 1) is very influential on extension growth, meaning it influences the size of leaves and the length of stems. For some plant species, flowering is accelerated most when photoperiodic lighting includes both red and far red radiation. Therefore, lamps that emit red and far red are advised, especially when crops are grown under light-limited conditions. In the absence of far red radiation, such as when plants are raised under sole-source lighting such as indoor growth chambers, leaves can be quite small. Therefore, adding far red to the light spectrum can increase leaf size, enabling plants to capture more light and potentially increase their growth. Artificial light sources vary significantly with regard to spectrum. 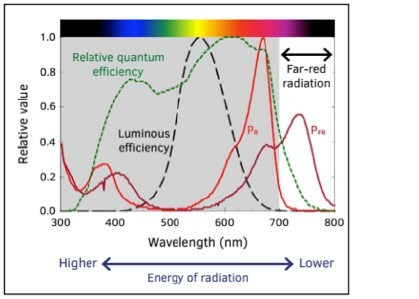 Similarly, various light sources emit differing amounts of far red, especially in relation to the total light emitted in all regions of the spectrum (e.g. 400nm to 700nm). Much is still unknown about the effects of far red and growers are just beginning to take advantage of far red to increase yield. 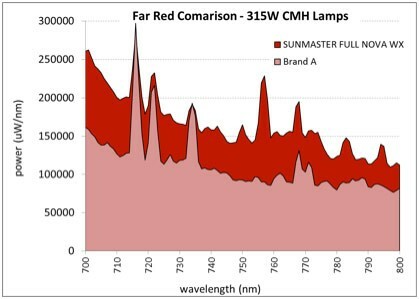 The far red contribution from typical ceramic metal halide lamps is about 10% to 15% of their output between 400nm and 800nm. Some LED light sources already include some far red output for horticultural applications. The ratio of far red to both red and blue areas of the spectrum is important as well. Unfortunately while much is known about plant response to the visible spectrum, the effects of far red are not as documented and are currently being studied by a number of universities.